Theological Teaching of the Homilies. A series of kindred works of a Judæo-Christian sect of the second century, of which only the Homilies, the Recognitions, and the Epitomes have been preserved. 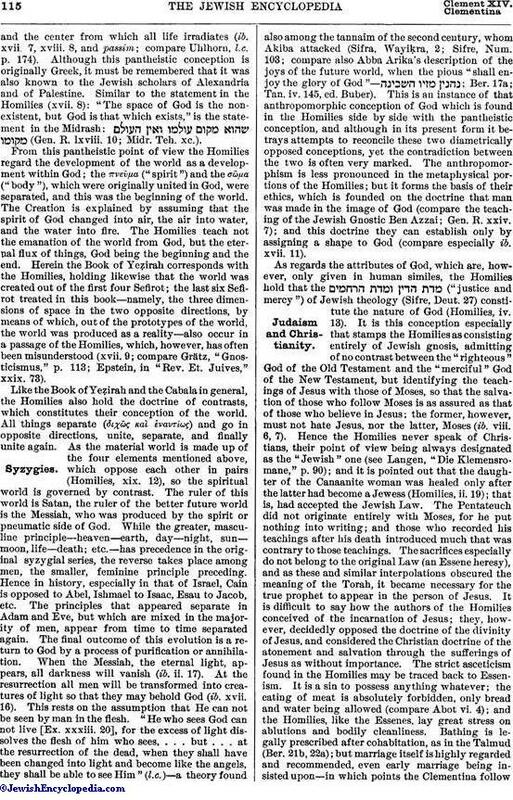 The Homilies, published first in 1853, present in the form of dialogues between Peter, Clement of Rome, and others, a gnostic system based on revelation. By revelation alone can knowledge be obtained, not by philosophy (Hom. i. 19, ii. 5). This is illustrated by the history of Clement, who vainly tried to arrive at the truth by means of philosophy. The Homilies assume a twofold revelation—the primal revelation, and the continuous revelation through the true prophets. The first was given in the act of creation, especially in that of man. The Homilies say, like the Mishnah (Sanh. 37a): "God revealed Himself by making man in His image; were there another god he also would have to reveal himself, and create other men in his image" (Hom. xvi. 10). Man as the image of God is God's revelation, and as he also has in him God's spirit (πνεῦμα), the whole truth lies in him like a seed, needing only to be developed. Had men recognized the will of God and been ready to obey it, there would have been no need of a further revelation; but as they have sinned, the primal revelation is obscured and a new revelation is always necessary (ib. i. 18, viii. 5). This is afforded by the true prophet, who knows the past, the present, and the future. His knowledge is not derived from the external world, but is innate, as is the spirit in him; and his revelation is not ecstatic, but clear and unambiguous (ib. ii. 6-12, iii. 11-20). The true prophet has appeared not in one, but in various forms; changing name and shape, he will traverse this world until he finds rest in the coming world, αὶΌν μήλλων (ib. iii. 20). Eight persons are exalted above the rest of humanity and brought into special connection with revelation—Jesus and the "seven pillars of the world," Adam, Enoch, Noah, Abraham, Isaac, Jacob, and Moses; and among these eight Adam, Moses, and Jesus are preeminent as possessing all the qualities of the true prophet (compare Uhlhorn, "Die Homilien," pp. 164-166). The Haggadah (Ḥag. 12b) also says that the world rests on seven pillars, but according to other authorities one pillar, by name, supports the world (compare Prov. x. 25). Αναμάρτητος is, according to the Homilies (ii. 6), the true prophet (compare also Suk. 52c on the haggadic interpretation of the "seven shepherds and eight princes"; Micah v. 4). As the person of the true prophet is always the same, so the religion revealed by him is always the same: the primal revelations through Adam, through pure Mosaism, and through Christianity are identical (Hom. xviii. 3). The fundamental doctrine of this, the only true, religion is that of the one God, the Creator of the world. "Before all things, consider that no one shares His rule, no one has a name in common with Him; that is, is called 'God.' For He alone both is, and is called, 'God.' Nor is it lawful to think that there is any other, or to call any other by that name. And if any one should dare do so, eternal punishment of soul is his" (ib. iii. 37). The attacks on those who deny the unity of God, and the positive proofs of that unity, constitute the greater part of the Homilies. The conception of monotheism is entirely Jewish, and all attempts to modify abstract monotheism in the Christian way are emphatically rejected. So much stress is laid on monotheism that it almost becomes pantheism, God being designated as τὸ Πᾶν, τὸ Ὄν, and everything else as nothing. He alone is; He is the tangible and the intangible, near and far, here and there; He alone exists. He penetrates everything. As the sun warms and illuminates the surrounding air, so God warms and illuminates the world; He is the heart of the world,and the center from which all life irradiates (ib. xvii. 7, xviii. 8, and passim; compare Uhlhorn, l.c. p. 174). 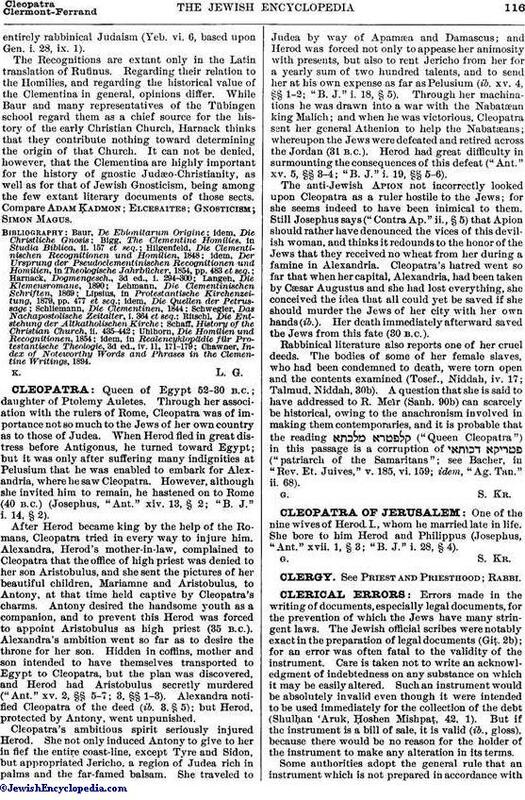 Although this pantheistic conception is originally Greek, it must be remembered that it was also known to the Jewish scholars of Alexandria and of Palestine. Similar to the statement in the Homilies (xvii. 8): "The space of God is the non-existent, but God is that which exists," is the statement in the Midrash: (Gen. R. lxviii. 10; Midr. Teh. xc.). From this pantheistic point of view the Homilies regard the development of the world as a development within God; the πνεῦμα ("spirit") and the σῶμα ("body"), which were originally united in God, were separated, and this was the beginning of the world. The Creation is explained by assuming that the spirit of God changed into air, the air into water, and the water into fire. The Homilies teach not the emanation of the world from God, but the eternal flux of things, God being the beginning and the end. Herein the Book of Yeẓirah corresponds with the Homilies, holding likewise that the world was created out of the first four Sefirot; the last six Sefirot treated in this book—namely, the three dimensions of space in the two opposite directions, by means of which, out of the prototypes of the world, the world was produced as a reality—also occur in a passage of the Homilies, which, however, has often been misunderstood (xvii. 9; compare Grätz, "Gnosticismus," p. 113; Epstein, in "Rev. Et. Juives," xxix. 73). Like the Book of Yeẓirah and the Cabala in general, the Homilies also hold the doctrine of contrasts, which constitutes their conception of the world. All things separate (διχῶς καὶ ἐναντίως) and go in opposite directions, unite, separate, and finally unite again. As the material world is made up of the four elements mentioned above, which oppose each other in pairs (Homilies, xix. 12), so the spiritual world is governed by contrast. The ruler of this world is Satan, the ruler of the better future world is the Messiah, who was produced by the spirit or pneumatic side of God. While the greater, masculine principle—heaven—earth, day—night, sun—moon, life—death; etc.—has precedence in the original syzygial series, the reverse takes place among men, the smaller, feminine principle preceding. Hence in history, especially in that of Israel, Cain is opposed to Abel, Ishmael to Isaac, Esau to Jacob, etc. The principles that appeared separate in Adam and Eve, but which are mixed in the majority of men, appear from time to time separated again. The final outcome of this evolution is a return to God by a process of purification or annihilation. When the Messiah, the eternal light, appears, all darkness will vanish (ib. ii. 17). At the resurrection all men will be transformed into creatures of light so that they may behold God (ib. xvii. 16). This rests on the assumption that He can not be seen by man in the flesh. "He who sees God can not live [Ex. xxxiii. 20], for the excess of light dissolves the flesh of him who sees, . . . but . . . at the resurrection of the dead, when they shall have been changed into light and become like the angels, they shall be able to see Him" (l.c. )—a theory found also among the tannaim of the second century, whom Akiba attacked (Sifra, Wayiḳra, 2; Sifre, Num. 103; compare also Abba Arika's description of the joys of the future world, when the pious "shall enjoy the glory of God"— ; Ber. 17a; Tan. iv. 145, ed. Buber). This is an instance of that anthropomorphic conception of God which is found in the Homilies side by side with the pantheistic conception, and although in its present form it betrays attempts to reconcile these two diametrically opposed conceptions, yet the contradiction between the two is often very marked. The anthropomorphism is less pronounced in the metaphysical portions of the Homilies; but it forms the basis of their ethics, which is founded on the doctrine that man was made in the image of God (compare the teaching of the Jewish Gnostic Ben Azzai; Gen. R. xxiv. 7); and this doctrine they can establish only by assigning a shape to God (compare especially ib. xvii. 11). As regards the attributes of God, which are, however, only given in human similes, the Homilies hold that the ("justice and mercy") of Jewish theology (Sifre, Deut. 27) constitute the nature of God (Homilies, iv. 13). It is this conception especially that stamps the Homilies as consisting entirely of Jewish gnosis, admitting of no contrast between the "righteous" God of the Old Testament and the "merciful" God of the New Testament, but identifying the teachings of Jesus with those of Moses, so that the salvation of those who follow Moses is as assured as that of those who believe in Jesus; the former, however, must not hate Jesus, nor the latter, Moses (ib. viii. 6, 7). Hence the Homilies never speak of Christians, their point of view being always designated as the "Jewish" one (see Langen, "Die Klemensromane," p. 90); and it is pointed-out that the daughter of the Canaanite woman was healed only after the latter had become a Jewess (Homilies, ii. 19); that is, had accepted the Jewish Law. The Pentateuch did not originate entirely with Moses, for he put nothing into writing; and those who recorded his teachings after his death introduced much that was contrary to those teachings. The sacrifices especially do not belong to the original Law (an Essene heresy), and as these and similar interpolations obscured the meaning of the Torah, it became necessary for the true prophet to appear in the person of Jesus. It is difficult to say how the authors of the Homilies conceived of the incarnation of Jesus; they, however, decidedly opposed the doctrine of the divinity of Jesus, and considered the Christian doctrine of the atonement and salvation through the sufferings of Jesus as without importance. The strict asceticism found in the Homilies may be traced back to Essenism. It is a sin to possess anything whatever; the eating of meat is absolutely forbidden, only bread and water being allowed (compare Abot vi. 4); and the Homilies, like the Essenes, lay great stress on ablutions and bodily cleanliness. Bathing is legally prescribed after cohabitation, as in the Talmud (Ber. 21b, 22a); but marriage itself is highly regarded and recommended, even early marriage being insisted upon—in which points the Clementina followentirely rabbinical Judaism (Yeb. vi. 6, based upon Gen. i. 28, ix. 1). The Recognitions are extant only in the Latin translation of Rufinus. Regarding their relation to the Homilies, and regarding the historical value of the Clementina in general, opinions differ. While Baur and many representatives of the Tübingen school regard them as a chief source for the history of the early Christian Church, Harnack thinks that they contribute nothing toward determining the origin of that Church. 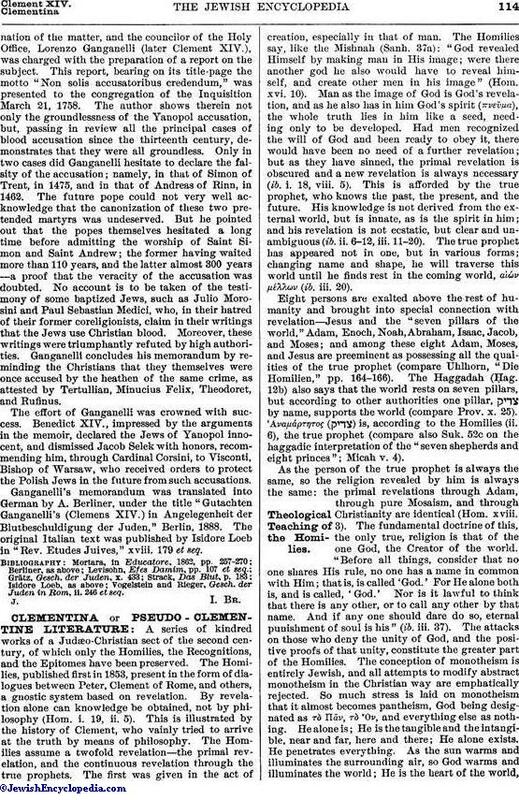 It can not be denied, however, that the Clementina are highly important for the history of gnostic Judæo-Christianity, as well as for that of Jewish Gnosticism, being among the few extant literary documents of those sects. Compare Adam Ḳadmon; Elcesaites; Gnosticism; Simon Magus. Chawner, Index of Noteworthy Words and Phrases in the Clementine Writings, 1894.